Besides being able to win a FREE Hot Rod at the very first Hot Rod Show in Los Angeles. 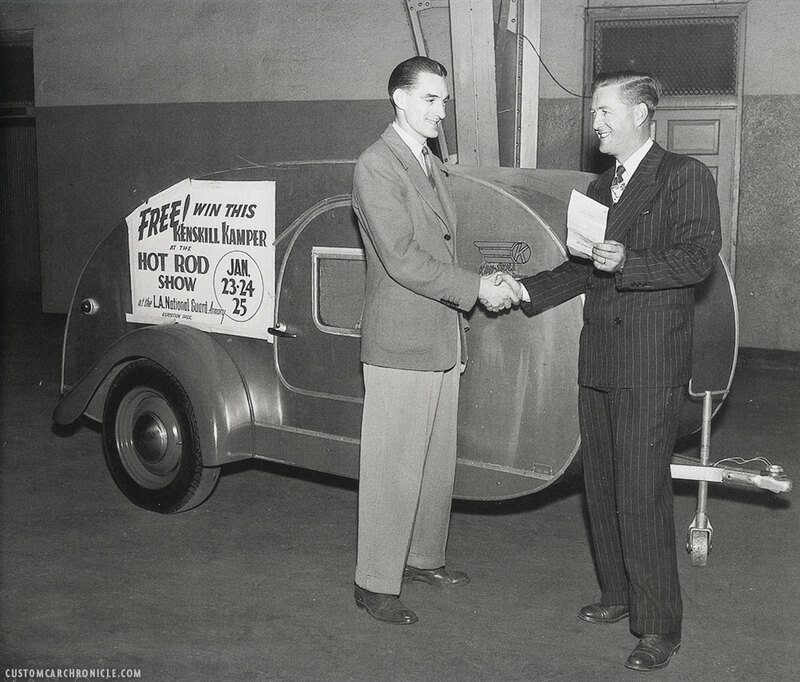 You could also win a cool Teardrop Trailer in 1948. Last night I was browsing a couple of books that I had not looked at for quite some time. One was about Trailer Travel in the US from the early days to the 1960’s. Interesting book with some nice pictures. Towards the end of the book my eyes spot the word “Hot Rod” in one of the pictures. I stopped flipping the pages and took a good look at the picture. 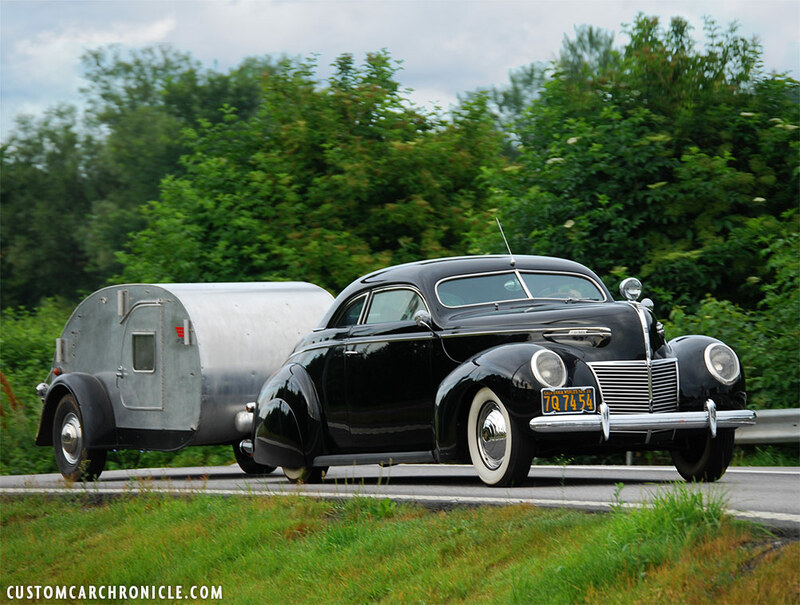 I recognized the trailer to be rather similar to one my good friend Tim Kirkegaard uses behind his full Custom 1939 Mercury. And the sign taped to the trailer reads Free! 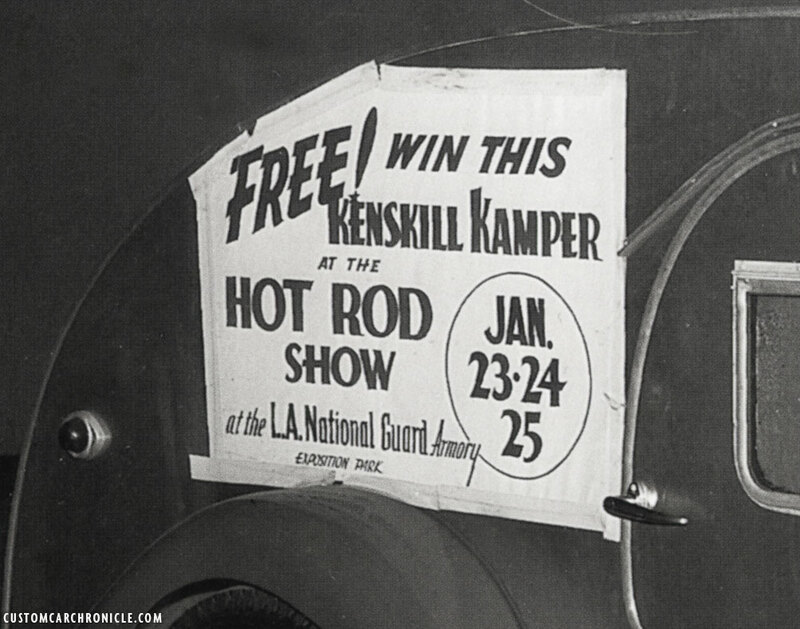 Win this Kenskill Kamper at the Hot Rod Show at the LA National Guard Armory Jan 23-24-25. I guess the owner of the Kenskill company is on the right, handing over the papers for ownership of the Kustom Kamper to the new lucky owner on the left. 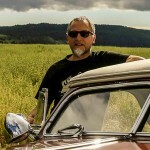 The photo caption in the book reads: The proud new owner of a teardrop. Courtesy of Delmar Watson. I knew that Tim’s trailer originated in 1947, so this photo must be from about the same time. I do not know the dates from all the early shows first hand, but I was thinking. 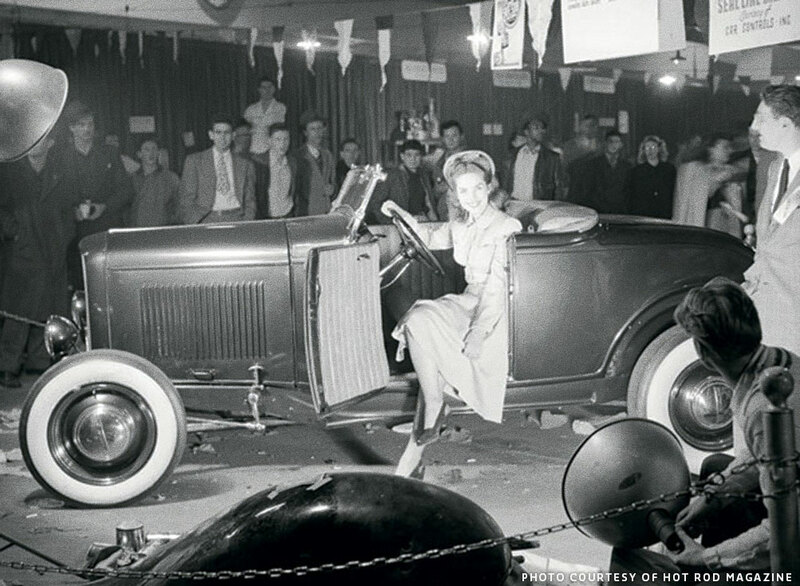 Perhaps this photo was taken at the very first Hot Rod Show in 1948, the one where George Barris took his ’41 Buick Convertible to be the only Custom Car attending. 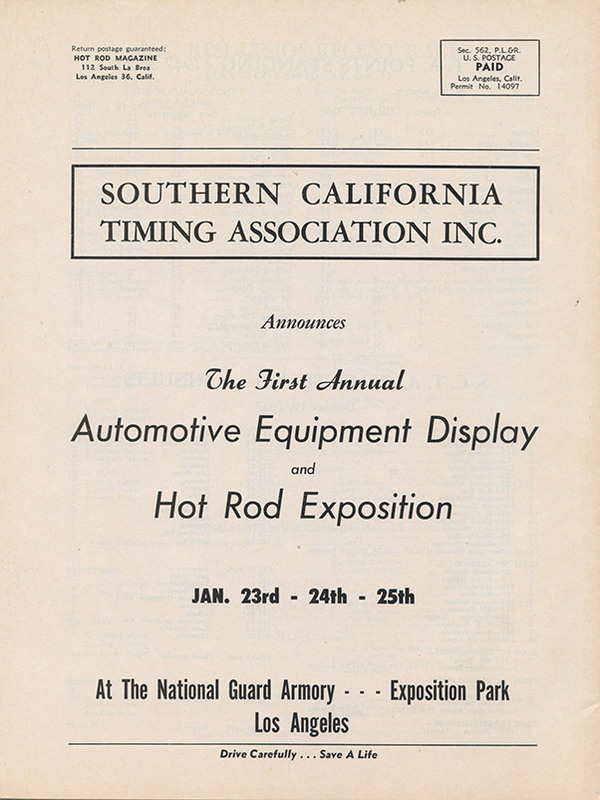 I looked up the dates in my files, and yep, there was an ad for the 1948 Southern California Timing Association Hot Rod Exposition with the same dates as on the sign. I had never heard about this Teardrop Trailer being given away at this first show. I knew about the Hot Rod that was assembled at the show and at the end given away to a lucky ticket holder. The Hot Rod magazine ad for the Hot Rod Exposition showed the same dates as on the trailer poster. I tried to find out more about this Giveaway Kenskill trailer, but so far no luck. Would be interesting to find out where it went to, if the lucky new owner was a Hot Rodder, or perhaps a Custom Car guy. Perhaps this Giveaway trailer might be the very same trailer my friend Tim bought many decades later. How neat would that be? 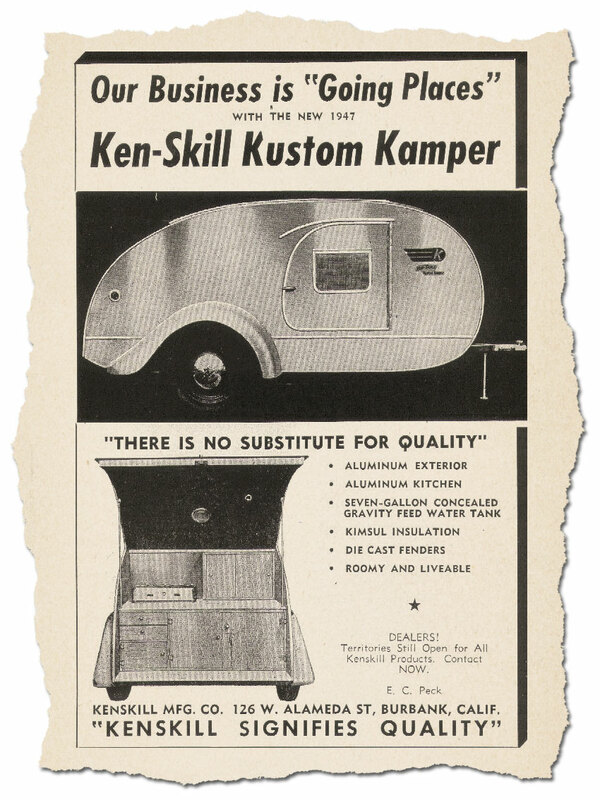 Kenskill magazine ad for the Kustom Kamper. The first annual Hot Rod Exposition was held in 1948 at the National Guard Armory in Los Angeles, California. The show was held on January 23, 24 and 25 in 1948. Around 55 000 people visited the show during the three days it was held. The photos we have seen from the event show a huge crowd, visualizing the HUGE success of the show. The show was organized by Wally Parks and the SCTA, and promoted by Robert E. Petersen. 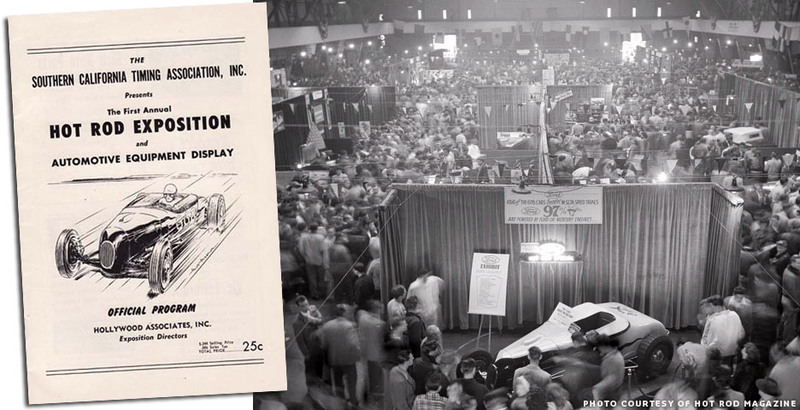 The very first Hot Rod Magazine was created as the program for the show, selling ads to whoever wanted to display as a vendor and hawking copies on the steps outside the Armory by its co-founder Robert E. Petersen. The show featured the best designed and engineered cars belonging to members of SCTA. 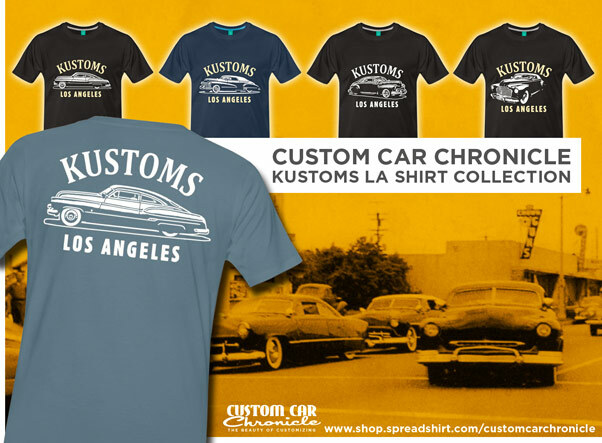 The show was originally called the SCTA Automotive Equipment Display and Hot Rod Exposition. The whole show was the idea of Robert E. Petersen, he wanted to arrange the show in order to raise money to build a dragstrip. The actual dragstrip was never built. During the three-day event a 1932 Ford was built and given away at the end of the show making it the very first Hot Rod door Prize. 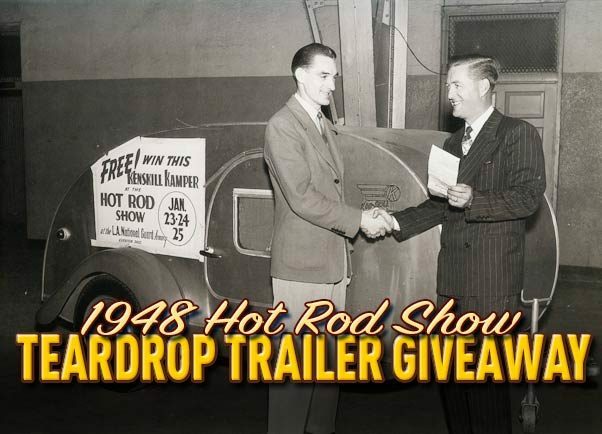 The first Hot Rod magazine does not mention anywhere that the Teardrop Trailer was also given away. So more than likely this was an initiative from the Kenskill company alone. 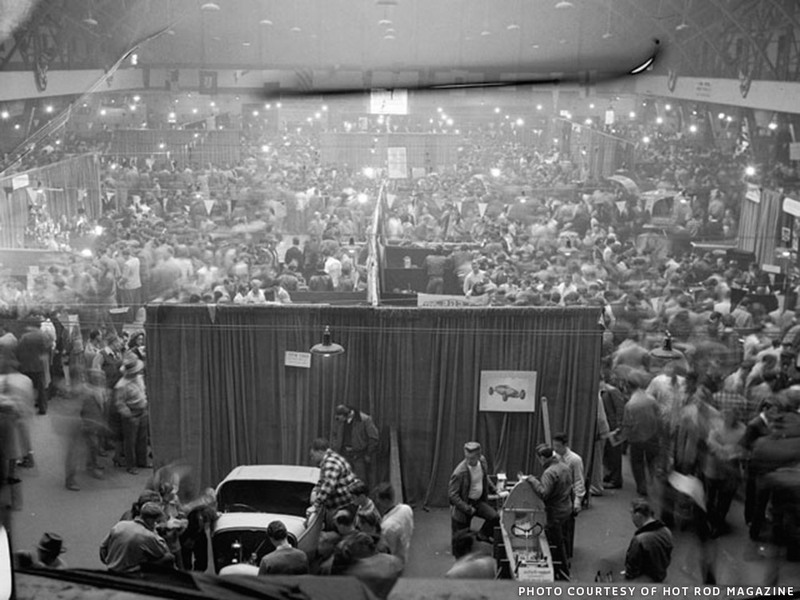 Huge crowds at the very first Hot Rod Show, the 1948 Hot Rod Exposition in the National Guard Armory at the Exposition Park in Los Angeles. The Show program is shown on the left. Celebrity Colleen Townsend poses with the giveaway 1932 Ford at the 1948 Hot Rod Exposition. 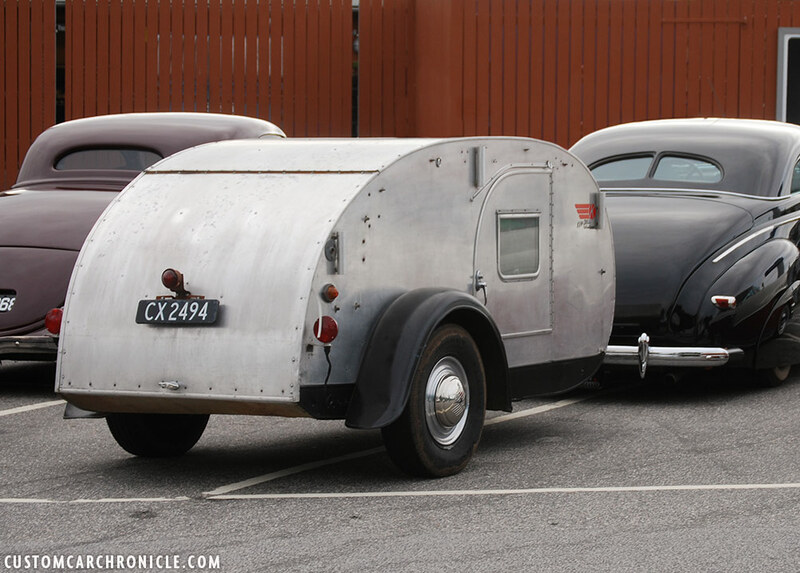 Tim Kerkegaard’s 1939 Mercury with his Kenskill Kustom Kamper teardrop trailer. What a fine combination. 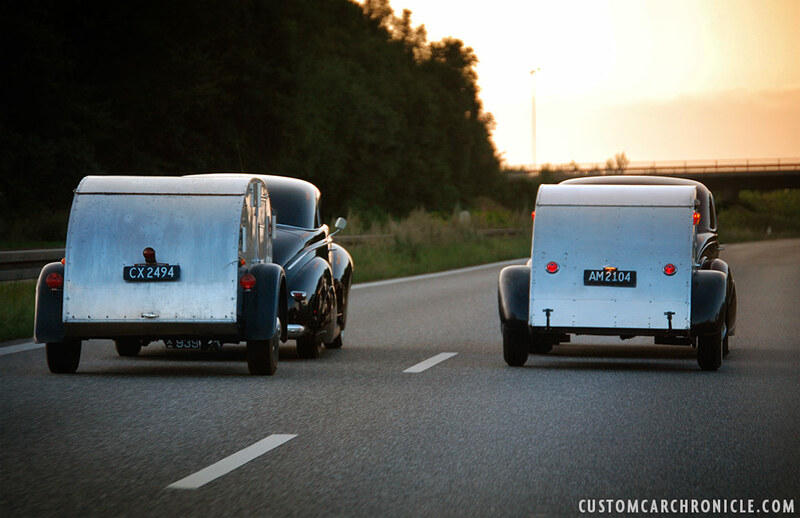 Teardrop trailers are popular among traditional Hot Rodders and Custom Car enthusiasts all around the world.